Cite is a highly successful Leicester based digital agency. Our skills span creative, technical, marketing and strategic disciplines and we go to extraordinary lengths to ensure our clients communicate as effectively as possible online. We've worked with a variety of clients, from local businesses to international brand names like Avis, TalkTalk, and Pfizer. Our services include creative design, web development & e-commerce, Facebook and mobile applications, search engine optimisation (SEO), Pay Per Click (PPC), and Digital PR activities. For more information give us a call at 0116 254 9888. 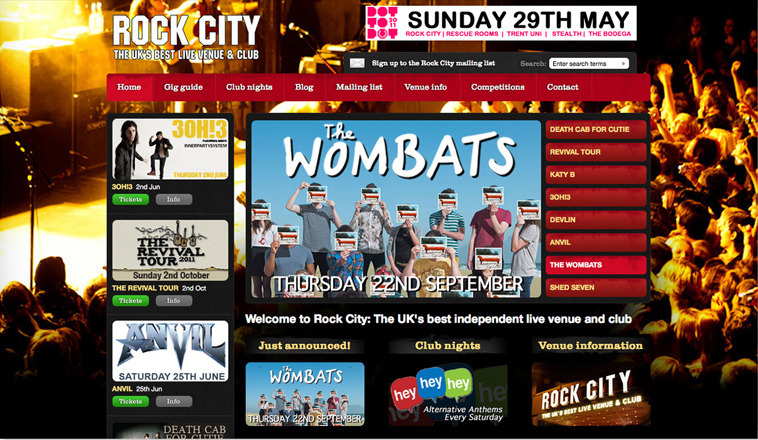 A screenshot from our Rock City website. Rock City is one of the UK's leading live music venues and club.